Saturday was warm and sunny, so naturally our first meeting for ages was indoors! Once again the Scottish Fisheries Museum in Anstruther played host to the cleaning and sorting of human bone fragments from Dunfermline Abbey Graveyard. Just a few of us along today: Campbell, Kathryn, Michal, Niamh and Ryan worked away at cleaning, sorting and supervising leaders Henry, Mark and Rob. We were joined by Dr Ennis Cezayirli from the School of Medicine at St Andrews University and a colleague of our leader Henry. Ennis is expert in identification of human bone fragments and was a great help to us. We met one last time on the 23rd at the Scottish Fisheries Museum. Just a few members made it so close to Christmas: Andrew, Campbell, Daniel, Elspeth, Fraser and Keziah. 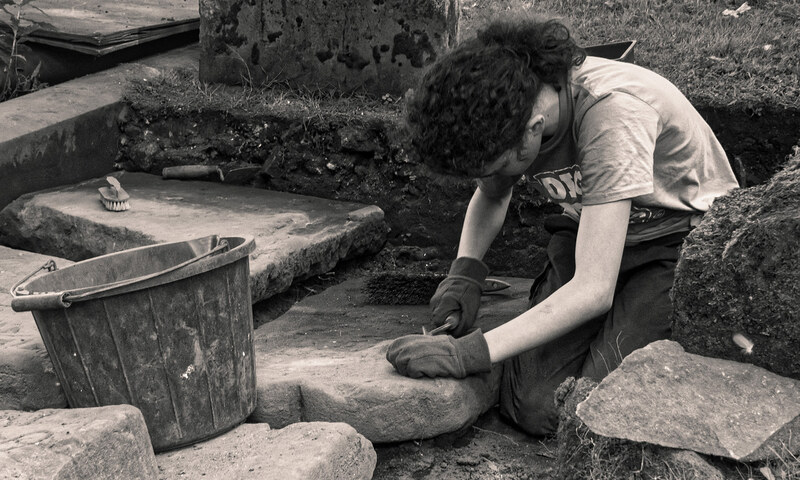 We sorted and cleaned bone excavated in Dunfermline Abbey Graveyard, helped again by Skelly and Stan. It’s fine for Skelly, he lies on his back the whole time, but poor Stan hangs around, standing for the entire two hours, being poked about by YAC members. We sorted trays of clean, dry bone fragment by type and then bagged them up. Inevitably we were left with a small number of unidentified specimens, some of which are likely to turn out to be animal. We were pretty sure that there were at least bits of chicken and pig bone to add to a growing assemblage of non-human bone. At the other end of the table a group of cleaners got on with that. We have excavated a lot of broken glass over the months, much of it thick, bottle glass. Some is just plain, but other pieces are coated in a gold paint of some sort. This tends to come away very easily, especially when the glass is wet, so we cleaned gently with damp toothbrushes. We also got on with cleaning some of the smaller bone fragments that we have excavated over the last few months. Some of these pieces will be too fragmented and damaged to identify, but there are likely to be more teeth, smaller human bones such as distal phalanges, and animal bones amongst them.